Sending a binary message through the web interface typically requires more knowledge of the binary SMS protocol that you are attempting to use. 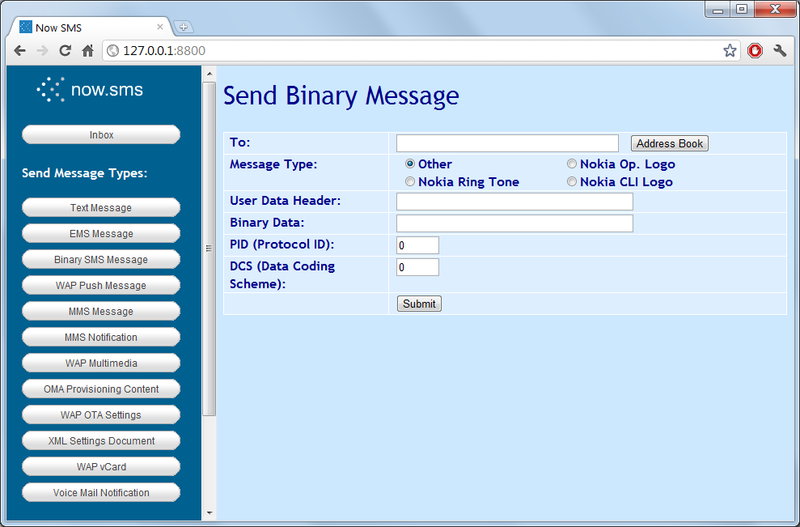 HTML forms are included for simplifying the process of sending Nokia Smart Messaging types, along with a general form for sending any binary message. 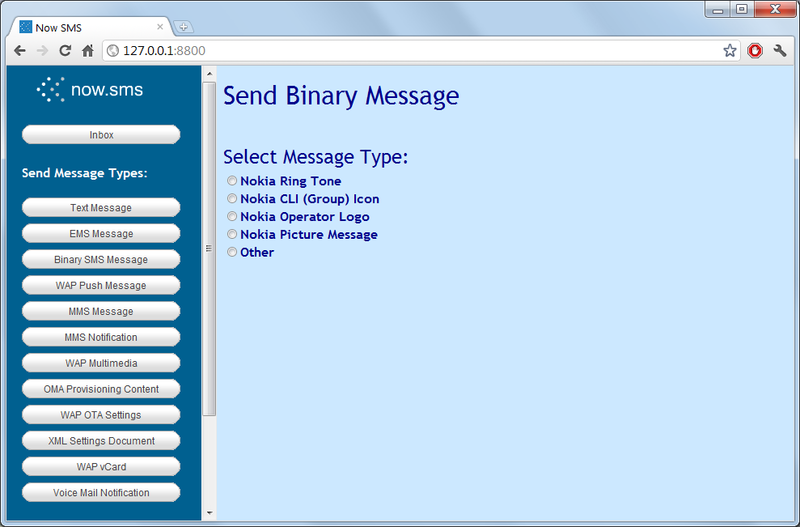 Please note that additional Nokia Smart Messaging functionality is also provided by the Send EMS Message web form. To send a Nokia ring tone, you must have a hex string value for the ring tone data. The hex string format represents two characters for each binary byte of ring tone data. Documentation of the ring tone data format is beyond the scope of this document. 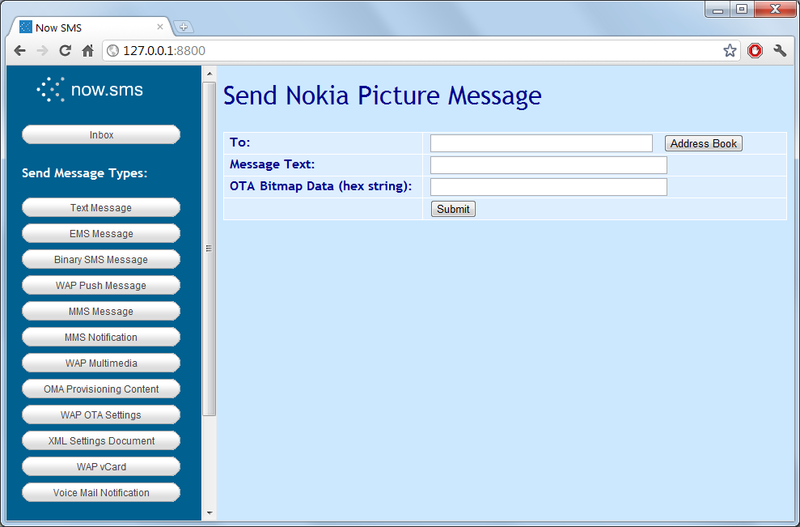 Please note that additional Nokia Smart Messaging functionality is also provided by the Send EMS Message web form. To send a Nokia Group Icon, you must have a hex string value for an OTA Bitmap, as defined by the Nokia Smart Messaging specification. The hex string format represents two characters for each binary byte of OTA Bitmap data. Documentation of the OTA Bitmap data format is beyond the scope of this document. Nokia Operator logos are one of the more complicated of the Nokia Smart Messaging formats. To send a Nokia Operator logo, you must have a hex string value for an OTA Bitmap, as defined by the Nokia Smart Messaging specification. The hex string format represents two characters for each binary byte of OTA Bitmap data. Documentation of the OTA Bitmap data format is beyond the scope of this document. You must also know the Mobile Country Code (MCC) and Mobile Network Code (MNC) values of the network operator to which the recipient is subscribed. A link on the form provides more information on MCC and MNC codes, and a pointer to the URL http://www.gsmworld.com/roaming/gsminfo/index.shtml, from which you can look up the MCC and MNC codes of various network operators. Nokia Picture Messaging should not be confused with MMS picture messaging. The Nokia picture messaging format typically only allows for the submission of small specially formatted black and white pictures, whereas MMS provides support for larger color images in a variety of different formats. To send a Nokia Picture Message, you must have a hex string value for an OTA Bitmap, as defined by the Nokia Smart Messaging specification. The hex string format represents two characters for each binary byte of OTA Bitmap data. Documentation of the OTA Bitmap data format is beyond the scope of this document. A picture message also includes a short text message. The “Send Binary Message Other” form allows for the submission of other types of binary messages. This typically requires more knowledge of the binary SMS protocol that you are attempting to use, but this web form can be convenient for testing.